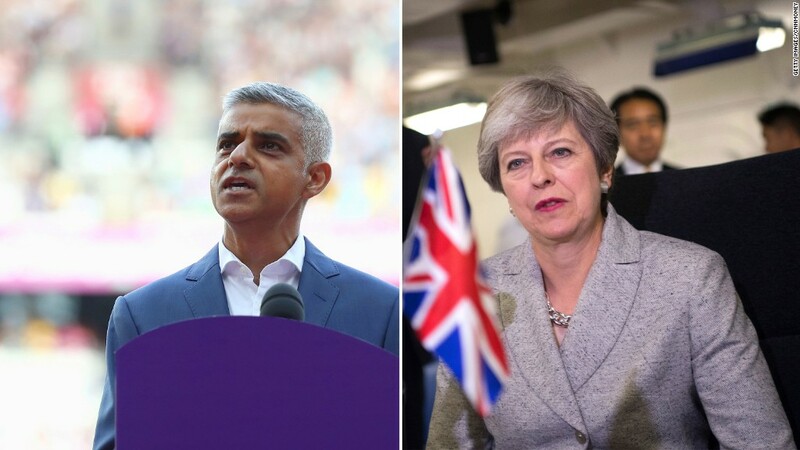 London Mayor Sadiq Khan has harshly criticized British Prime Minister Theresa May's handling of Brexit, saying she "needs to get a grip" and prioritize the needs of the country over internal party politics. Khan accused May's government of having "no game plan" for its divorce from the European Union on Thursday, hours after negotiators acknowledged that no major breakthroughs had been achieved during a third round of talks in Brussels. Investors are worried that Britain risks an acrimonious divorce from its biggest trading partner unless the discussions start to yield results soon. Fourteen months have passed since the U.K. voted to leave the EU, a process that must be completed by March 2019. Khan, a member of the Labour Party, told CNNMoney on Thursday that it wasn't "clear what [the government's] strategy was going to be" during talks with the remaining 27 members of the EU. "An extreme hard Brexit is no good for the U.K., and it's no good for the European Union," he said. In response, a government spokesperson said that May is "getting on with the job of securing the best deal for the U.K. as we leave the European Union." The spokesperson noted that May entered into "a joint declaration" on the economy with Japan Prime Minister Shinzo Abe. Khan has been critical of the government's approach to Brexit, but his comments on Thursday were among his most forceful on the subject. London makes up roughly 13% of Britain's economy, and it's a magnet for immigrants who work in its finance and tech industries. Leaving the EU threatens much of what makes the city an economic powerhouse. Khan said that May should put more emphasis on reaching an agreement with the EU that protects the nation's economic interests. "Her priority shouldn't be the Conservative Party's internal machinations," the mayor said of May. "Her priority should be what's good for our country, what's good for jobs, what's good for prosperity." May has promised to take Britain completely out of the EU's common trading area and slash the number of people coming from the bloc. However, the government has been forced to moderate its position since she lost her parliamentary majority in June. Businesses -- both British and foreign -- want an arrangement that gives them time to get used to the new relationship with the U.K.'s biggest export market. They also want reassurances about hiring EU citizens. The British government has acknowledged the need for some kind of transitional period. But May has also insisted that Britain will leave the EU's single trading market and its customs union in March 2019. This week she also stood by her previous claim that "no deal" with the EU would be better than a "bad deal." That kind of talk is worrying investors, trading partners and the mayor of London. "We need to have access to the single market, if not membership of the single market," Khan said. "Nobody who voted to leave the EU voted for us to be poorer." Khan's own party has sought to clarify its position on Brexit in recent days. The Labour Party announced over the weekend that it now favors remaining in the EU's single market and customs union during a transitional period. It acknowledged that this would mean accepting EU rules on immigration and the jurisdiction of the European Court of Justice.